Not your average dual-controller array: that's the conclusion after a canter through HDS's new HDS Unified Storage (HUS) 100 series array controller architecture. There are three different controllers in the series for block access and two for file access – NAS heads. Both types use non-commodity hardware. For block access all three models have symmetric, dual active-active controllers with mirrored cache. The HUS110 and 130 have 2U controller enclosures and the 150 has a 3U one. A block controller contains a dual core Xeon processor with 3.5GB of RAM. This is responsible for all I/O operations for that controller for the group of LUNs on its management list. It is accompanied by a Data Control ASIC handling RAID control and cache memory, which has associated NVRAM and DDR3 cache. There is a PCIe 2.0 bus within the controller, with 8-lane connections. There can then be two host I/O Module controllers; one for Fibre Channel and the other for iSCSI. HP calls these Tachyon processors. At the back end there can be two SAS controllers, each with 8 x 6Gbit/s links to local storage and to expansion trays connected via 16 x 6Gbit/s redundant SAS links. 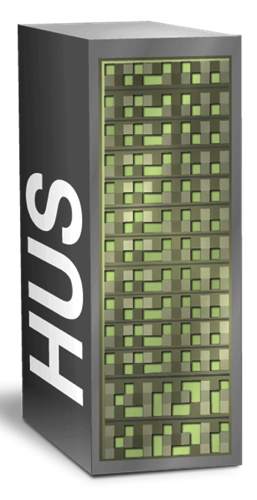 The HUS 110 supports only 8 SAS links on the back end: a slower processor, a smaller cache and fewer host channels than the HUS 130, which has 16 SAS lines but fewer disks than the HUS 150. The 2U HUS 110 and 130 controller enclosures can contain 12 x 3.5-inch hard disk drives or 24 x 2.5-inch disk or solid state drives. For capacity expansion there can be 2U enclosures, holding 24 x 2.5-inch SAS disk or solid state drives or 12 x 3.5-inch 7,200rpm SAS disk drives, or 4U trays holding 48 x 3.5-inch 7,200rpm SAS disk drives. The HUS 110 only supports the 2U expansion enclosures, and 120 disk drives in total,while the HUS 130 and 150 support both types of expansion tray, with the 130 supporting up to 264 disk drives and the 150 up to 960. A Josh Krischer white paper (PDF) on HUS provides much more speeds and feeds information. In principle, any host port can be used to access any LUN managed by either controller, without any need to change LUN ownership. This is the basis of a load-balancing capability whereby LUNs are moved from an overburdened controller in an active-active pair to the other, less burdened one. A host accessing a LUN through a Controller-0 can actually have most of the I/O request processed by Controller-1 with little intervention by the processor in Controller-01. This function allows the use of host-based operating system path management and load balancing such as Microsoft Windows MPIO, Solaris MPxIO/traffic manager, IBM AIX MPIO, Linux Device Mapper, Veritas DMP or Hitachi Dynamic Link Manager with minimum overhead penalties. This feature is in particular useful in automated failover. Contrary to the way El Reg storage desk outlined it in the history of HUS story, the file controllers are essentially BlueArc-based NAS heads using that HNAS product's FPGA hardware architecture and SiliconFS object-based file system. The HUS 110 and 130 use the 3080 HNAS controller as dual modules that are cluster-capable. The HUS 150 uses the HNAS 3090 with dual-node and 4-node clustering. The HUS intelligent file tiering feature can move selected files or folders to an appropriate tier of storage, both internally to HUS or, if they are inactive, to an external tier, using content-aware rules and a policy manager. This has the happy benefit of decreasing the size of the overall HUS dataset and thus reducing its data protection resource requirements. Object storage on the HUS arrays is handled by the NAS heads. Objects are stored as files with specific metadata, which cannot be added to by customers. They are not stored with hash addresses, erasure coding or any addressing scheme related to their content. So these are quasi-objects. Nevertheless they exist as a single logical searchable object pool as HDS's Data Discovery software can search their metadata and content along with object content and metadata on the HCP true object storage system. HUS objects cannot be exported to HCP; the HUS automatic tiering system can't do this, says HDS. Its EMEA chief technical officer Bob Plumridge wouldn't commit to HDS making this possible. Clearly such a development would be in line with HDS's ambition to provide a seamless single file, block and object storage facility. Plumridge said he had seen more change at HDS in the past two years than in the previous 10. It's apparent that the product range has and is broadening. As well as the low-end F-series filer being added to the HDS product set, a high-end scale-out file product based on Parascale technology should arrive before the end of the year, taking HDS into Isilon territory. support the vStorage API for Array Integration (VAAI). the vStorage API for Data Protection (VADP) is supported. The Krischer white paper mentions several areas where HUS performance exceeds that of the replaced AMS arrays, due to more powerful controller processors and larger memories. The SAS links to the disks have doubled in speed from 3Gbit/s to 6Gbit/s. There are faster internal busses and faster DDR3 cache modules. THe DCTL chips have been redesigned from their AMS state and feature faster internal paths as well as double the number of DMA ports. Using RAID 1+0 and a 50:50 random read and write mix, a HUS 150 was 30 per cent faster than an AMS 2500 product. It was 87 per cent faster doing sequential reads and 158 per cent faster doing a 50:50 sequential read and write mix. There are similar improvements with a RAID 5 configuration. Krischer states that the HNAS 3090 – and therefore the HUS 150 file controllers – supports much higher scalability with better throughput than comparable products from EMC and NetApp (the VNX5500 and FAS3270 respectively). The FAS3270 is comparable to the HUS 150 and is optimised for file access, but Krischer notes that it supports a 2-controller configuration only rather than the four seen in the HUS 150. He says that EMC's VNX supports up to eight NAS heads (x-blades), but does not support a single namespace as HUS does. Also, he adds: "The VNX supports FAST VP and the IBM V7000 supports Easy Tiering, which are sub-LUN, automated storage tiering for blocks, but don’t support equivalent functionality for files without additional software." All in all, Krischer thinks the HUS 100 products are strong competitors in the unified storage space and should help HDS grow its business there. European value-added distributor Zycko is of a similar frame of mind. Pricing is going to be important and it will be interesting to see how that compares to that of the competition. End-point protection for non-shared files? Wait, isn't that standard for everyone?